Olivier Award-winning playwright Jack Thorne adapts Charles Dickens’ classic tale A Christmas Carol for the stage, starring BAFTA Award-winning Welsh actor Rhys Ifans. Playing a strictly limited festive season at The Old Vic, beginning in November, the uplifting play follows Thorne’s recent adaptation of Woyzeck, featuring John Boyega in the title role. Rhys Ifans stars as Ebenezer Scrooge, after most recently appearing as the Fool alongside Glenda Jackson in last year’s acclaimed King Lear at The Old Vic. Ifans is well-known for his various film appearances, including Harry Potter and the Deathly Hallows: Part 1, Alice Through the Looking Glass and Notting Hill, with theatre credits including Don Juan in Soho at the Donmar Warehouse and Beautiful Thing at the Duke of York’s Theatre. Further casting includes Olivier Award-winner John Dagleish (Sunny Afternoon) as Bob Cratchit, Maria Omakinwa as Mrs Cratchit, Melissa Allan as Little Fan, Jamie Cameron as Young Ebenezer/George, Erin Doherty as Belle, Tim van Eyken as Nicholas, Alex Gaumond as Father/Marley, Siena Kelly as Jess, Eugene McCoy as Fred, Myra McFadyen as Ghost of Christmas Past, Alastair Parker as Fezziwig and Golda Rosheuvel as Ghost of Christmas Present/Mrs Fezzwig, as well as Oliver Evans as Ensemble. Jack Thorne adapts the story for the stage, with recent credits including musical Junkyard and the multi-award winning Harry Potter and the Cursed Child. Artistic Director of The Old Vic Matthew Warchus directs, with design by Rob Howell, lighting design by Hugh Vanstone and sound design by Simon Baker. A Christmas Carol also features original compositions and arrangements by Chris Nightingale. 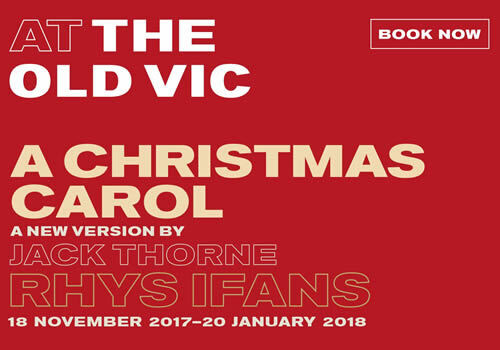 An iconic seasonal tale of family, festivities and the importance of sharing, A Christmas Carol plays a limited season at London’s Old Vic Theatre, from November 18th 2017 to January 20th 2018, with an official opening night on November 29th 2017. A Christmas Carol is recommended for those aged 11 and up. Please note that the production contains haunting images and some scenes that younger audience members may find upsetting.